I feel like the table for your Thanksgiving meal should be elegant and beautifully decorated with colors of fall. This is the meal where you pull out your finest dishes and glassware. Even if you do not have fine china, you can make your table beautiful with what you have. I am so thankful to be included in this blog hop of Thanksgiving tables, recipes, and DIYs. Thanksgiving is always at my house. My mother-in-law host Easter lunch at her house and my mother host Christmas dinner at her house but Thanksgiving is always at my house. Maybe that is why it is my very favorite holiday. I have made the Thanksgiving meal for over 20 years and I have developed a schedule to make preparing the meal easier with less stress for you and your family. You can view my post on How to Host Thanksgiving. We have a large family so my husband and I built this DIY Zinc Table large enough to seat a lot of people. You can view the post-DIY Zinc Table for the tutorial and step by step photos. I always set my table the weekend before Thanksgiving. I wash my linens and polish my silverware on Saturday or Sunday before Thanksgiving. I do not like to put a lot of decor on the table because I need plenty of room for some of the food items. I feel like food looks best on white dishes. When I was in Culinary School, we only used white dishes and most restaurants use white also. My daughter purchased these beautiful square plates for my birthday and she found them at Walmart. You do not have to spend a lot of money for beautiful dishes. I love the napkins that I found at HomeGoods. These napkins have beautiful gold, silver, and brown colors that pick up all the colors on my table and also the zinc table top. I feel like I can use the napkins all year long. My glassware and silverware were given to me by someone who was getting new glasses and silverware. I purchased all my other decor from HomeGoods. 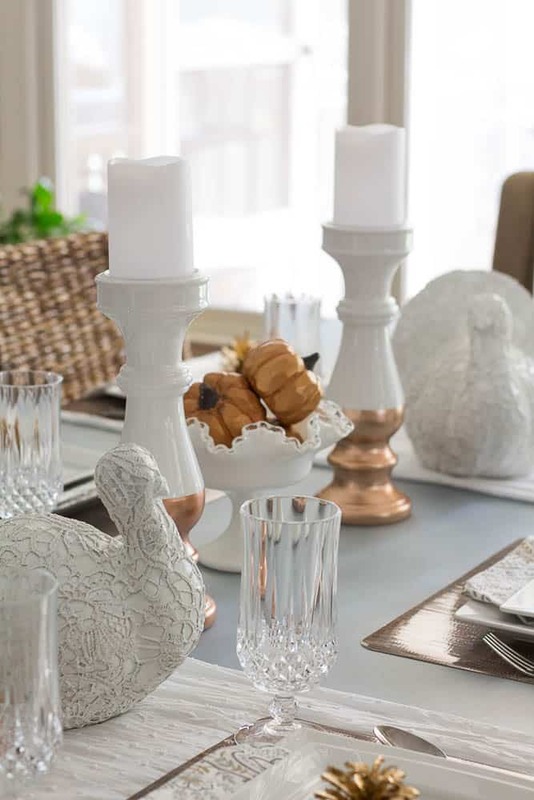 I fell in love with these lace turkeys and I feel like the white color turkeys brighten up the table. I love the copper and white candle holders and they were very inexpensive. They are topped with some dollar store candles. 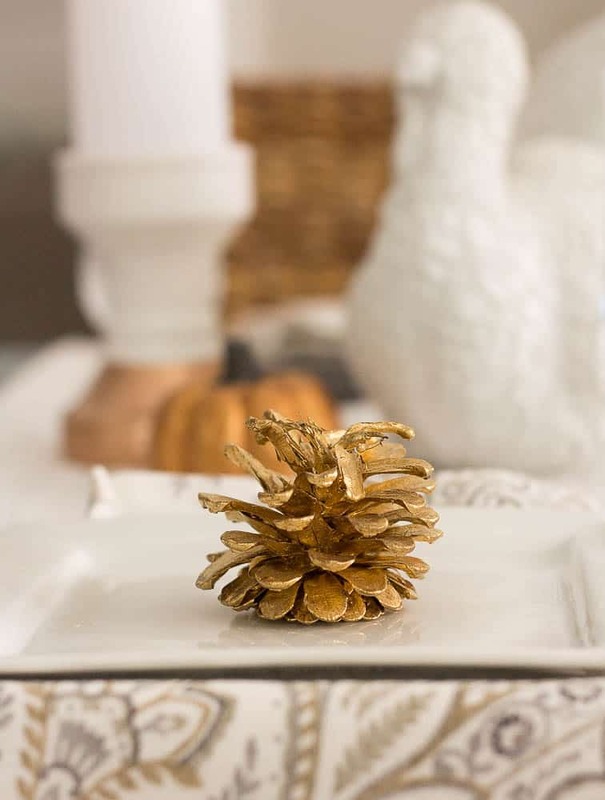 I have had these gold painted pine cones for years and I use them in many different ways. Today, they are plate toppers. I really feel like my table looks like it is ready for the food! I hope you all have a happy Thanksgiving and please go check out the other talented blogger’s creations. I fell in love your your handsome zinc table when I first saw it earlier this fall. The modern details of the square plates and table decor are the perfect complement. Your lace turkeys are so unique! Sherry, what a beautifully calm and inviting tablescape you’ve set. I really like the neutral appearance and how well you put it all together. I am a champion of mixing high and low elements also, and really appreciate that in others, too. Those turkeys are great! They look like vintage doilies applied. I recognize the stemware as Longchamp (same one my Mr. brough to our marriage). I just recently found a few more pieces at an estate sale to add to my own collection. You certainly have done the holiday justice in your tablescape for Thanksgiving, and that table – it’s such a rock star in the blogging community! You guys did a fabulous job on that. I’m happy to be part of this hop with you this week. It really is a terrific lineup so far. Sherry, I can feel your love for your family and your generous hospitality through the screen. Your table is understated and simple but very elegant. 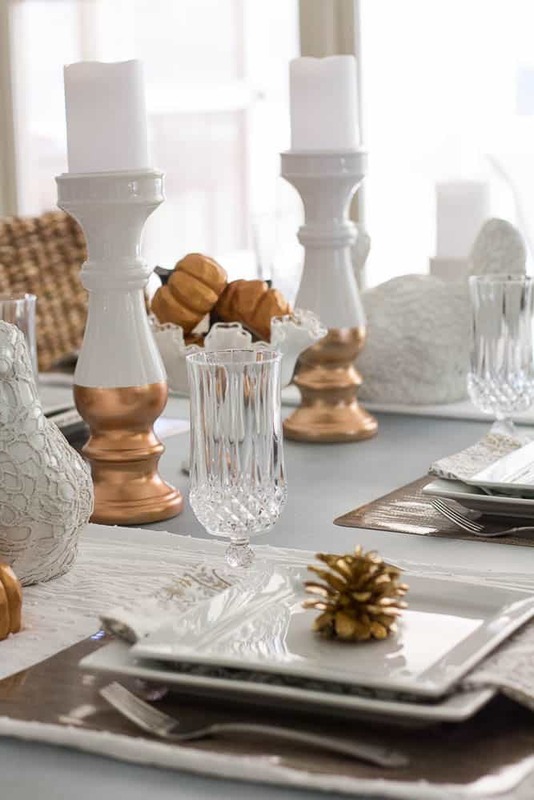 I like the shiny gold pinecones and copper tips on the candleholders. Love your square white dishes.I especially like the two lace turkeys flanking the centerpiece which to me is the piece de resistance. 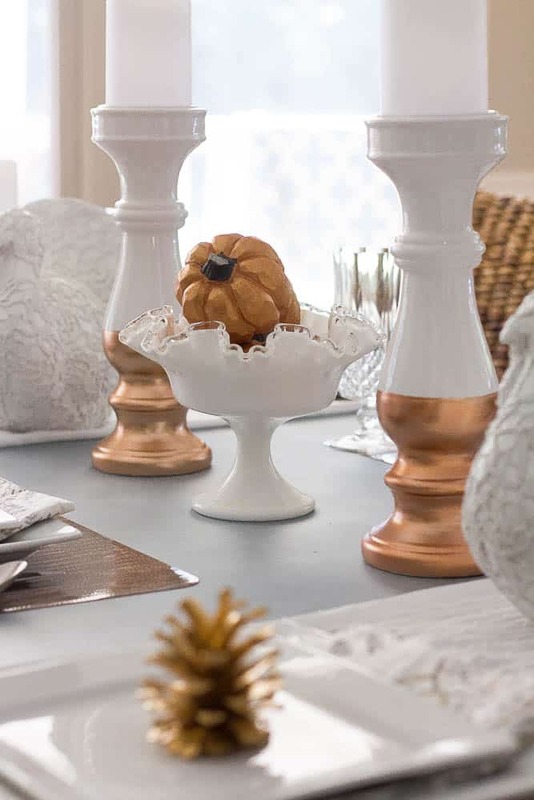 The vintage scalloped compote holding the pumpkins is a perfect vintage touch and adds warmth and charm. Enjoyed posting on the same day as you. Love the lace turkeys! Your table is just stunning, simple, elegant, beautiful! What an elegant and inviting Thanksgiving table! I so agree about the white plates and I really enjoy your square set. 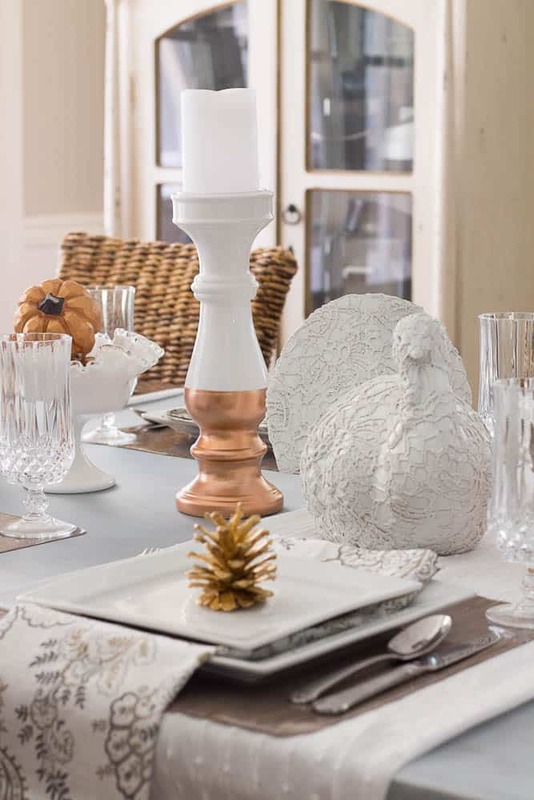 The copper and metallic place mats and pinecones really pop against the white. That lace turkey is precious. We don’t have Home Goods here in Canada, but I think our Home Sense is similar, and it is a great source for fun things like this. I am all for traditions and it is wonderful that the you find such joy in hosting Thanksgiving for your family! I love your lace turkeys! They caught my eye immediately and then as I looked at your beautiful white table, I became more enchanted. Your eye for detail and simplicity and elegance is amazing. What wonderful blog hopping with you. Sherry, your table is elegance in simplicity and details! 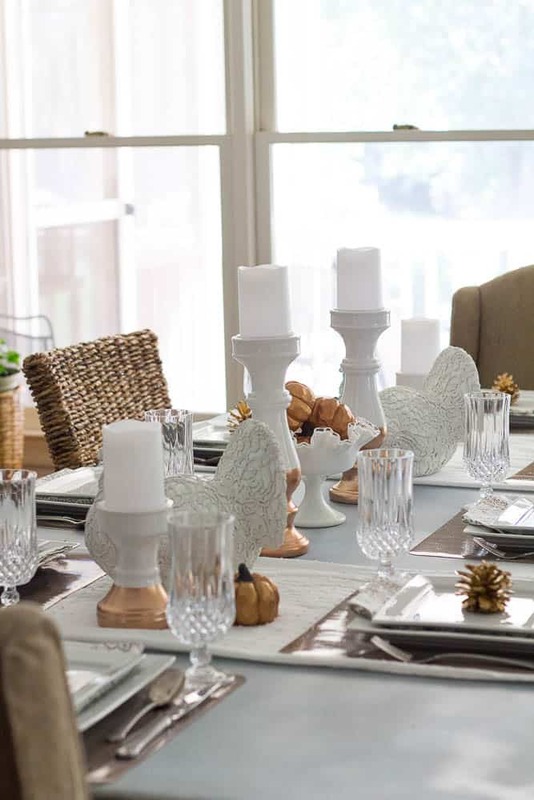 I love the lace turkey and the white and copper candle stands! Food always is the star on white plates! I am enjoying blog hopping with you this week! Hi Sherry! Thank you for sharing your beautiful thanksgiving table. I would agree everything looks better on white dishes. Your beautiful new table is the perfect highlight as we move into the holiday season! I love your tablescape for Thanksgiving, it is similar to mine in its neutrality. Such a calm compared to the explosion of color so many of the trees offer us out of doors this time of year. Your gold accents are just the perfect touch. I spotted those same lace turkeys at my Home Goods! I am so thankful to have you as part of my tablescaping blogger tribe! Thank you for being a part of another hop! Sherry, Your table just looks lovely. I love a simple, uncluttered look, and you accomplished it. I loved everything about it, from the gold painted pinecones to the lace turkeys. Just wonderful! Great job! I am loving the mix of your white dishes with the mixed metals of the zinc table, copper candle sconces and gold pinecones. 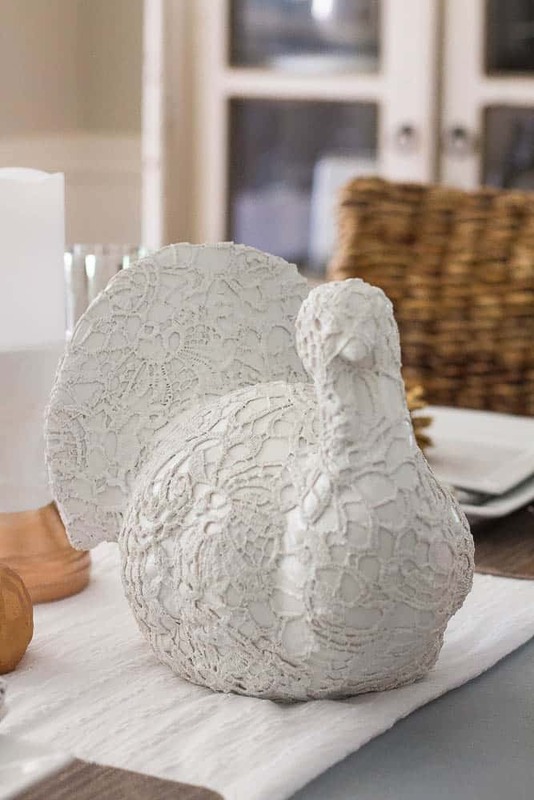 The lace turkeys are perfect to bring in some texture. What a beautiful table, it is a great addition to all the lovely tables thus far in the hop! Your gorgeous zinc table is the perfect foundation for this elegant tablescape. The lace turkeys add an elegant, festive touch. I adore white dishes, too. Love to mix and match them. But that zinc table! Swoon. It was a pleasure to blog hop with you! Sherry, I absolutely love your light and bright thanksgiving tablescape. And that lace turkey!! I’ll need to find that one. I didn’t know that you went to culinary school. Me too! I know exactly what you mean about white plates. Food does look better on a white dish. It’s only at Thanksgiving that I deviate to my green Thanksgiving dishes. The zinc table is wonderful ~ so unique and farmhouse. Just love everything on your table. Sherry, I love the simplicity of your table, along with all the white and gold! That lace turkey is stunning. Thanksgiving is usually at our house, but we’ll be in Texas this year, so I don’t have to stress about hosting it. Hooray! White and gold is always a good choice for an elegant tablescape! Beautiful! I remember your post about the zinc table and it’s a stunner! The white lace turkeys are so unique, they are whimsical and elegant at the same time. White dishes are indispensable for entertaining and your square plates are pretty. Have a Happy Thanksgiving and I look forward to blog hopping with you again. A beautiful table for Thanksgiving. The white pops with the copper. The white square plates are lovely and a perfect gift. Spray paint is my best friend…LOL The lace turkey is gorgeous and would hop into my car too. Thanks for sharing your pretty table. 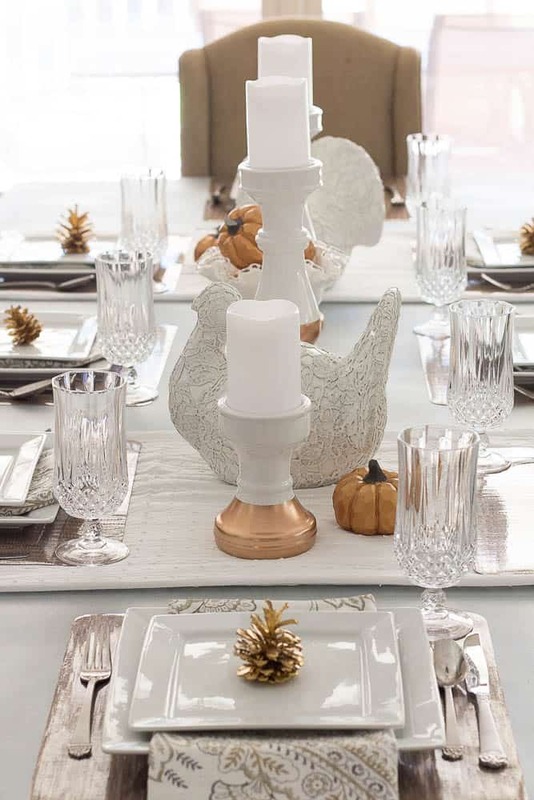 Love the monochromatic look of this Thanksgiving tablescape. It is so stunning!! Thank you! I just linked up!! Sherry your table scape, along with that gorgeous one of a kind table, is full of textures and colors. So much pretty in one table! Love that turkey with the lace over it. It is a pretty table, and I’m sure the zinc surface is easy to clean. It looks nice too. Love those lacy turkeys. It’s simple, yet very elegant. Discovered your lovely tablescape through the Creative Corner link-up. Fell instantly in love with the lace turkeys. The table is so pristine and beautiful that I would be afraid to let my gang eat there. We would have cranberry sauce and gravy all over everything. It would look like a piece of modern art after Thanksgiving at our house. But I just love it! Leslie, You comment cracked me up! Thank you for the compliment! Your Thanksgiving Table is so light and inviting and the contrast is just perfect. 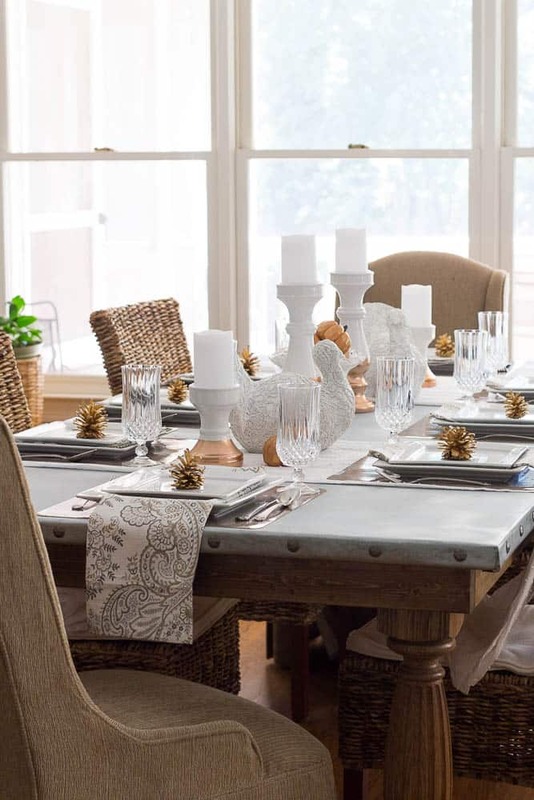 I love the white lace turkeys on that Zinc Table that is a stunning look. 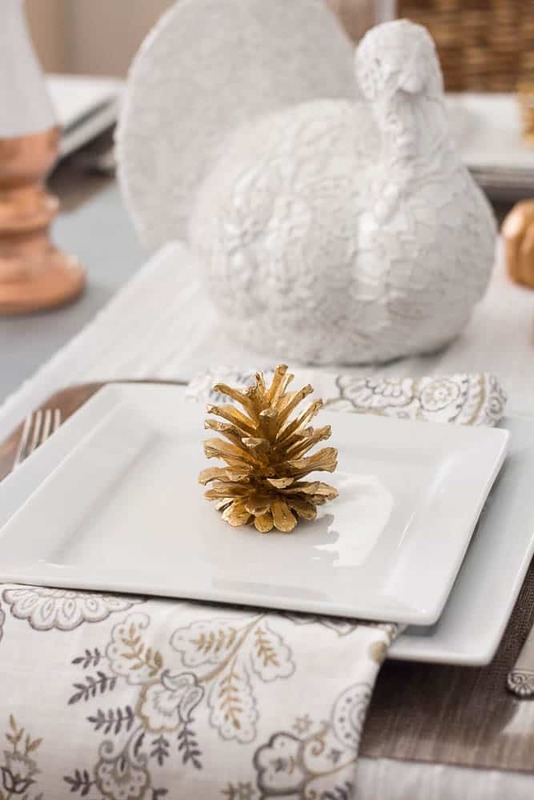 The gold pine cone in the plate really completes this lovely table. Thanks so much for sharing your awesome post with us at Full Plate Thursday. Hope you are having a good week and come back to see us real soon! Sherry, your tablesetting is lovely! I love how your daughter found the ethereal white plates at Wal-Mart ~ there are a lot of really good finds out there which are inexpensive but look luxe! <3 Love your lacy turkey!!! Hey girlfriend, what time should I be over? And what can I bring? I do wish we were close enough to pop over and wish each other Happy Thanksgiving in person! Your table looks so inviting and I KNOW your food will be phenomenal. Happy day my friend. Thanks so much for joining our blog hop! Your table is so stunning and I love that you made your beautiful table! Looks like your family is in for a lovely Thanksgiving meal!!! Enjoy your Thanksgiving Sherry, your table setting looks amazing and so so festive! Love your zinc table! Love your lace covered Turkeys!! How cute! They just add to the beauty of your gorgeous table!! And your table is amazing too! What a beautiful table! I love the whites mixed with the copper. And your zinc table is gorgeous! I am in love with that turkey, Sherry! I love your table too of course but that guy won me over. Everything looks wonderful and so very inspiring. This is just beautiful! Happy Thanksgiving!